Great comforter! I've had for almost a year and it looks great, is soft and warm. Treat yourself to a cozy night's sleep with this excellent down alternative comforter from Blue Ridge Home Fashions. 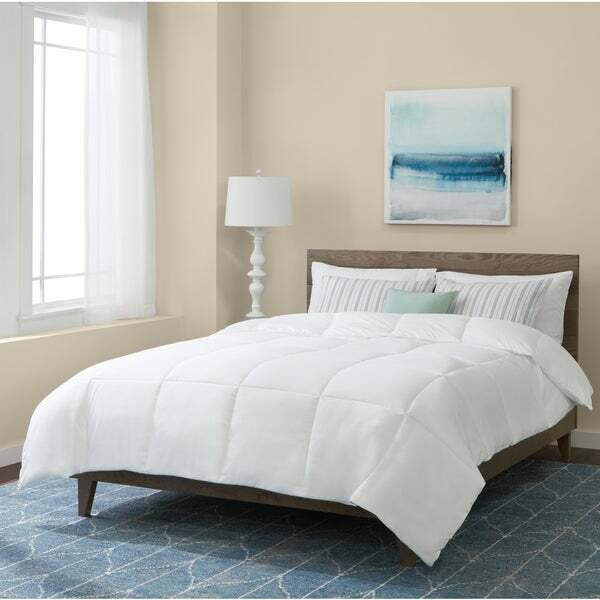 Carefully crafted with a premium polyester fill, this comforter is naturally hypoallergenic and rated for use in any season. The crisp white microfiber cover features an ultra-soft feel, and incorporates end-to-end box stitching that ensures the fill stays neatly in place. This comforter is fine as far as the warmth goes, how it is made and the materials used. I didn't want a heavy comforter and this one is great for summer. My only issue with it is that I ordered one for my new king size mattress and it covers the top of the mattress and just a tiny bit on the sides, but not enough to even remotely look like the picture of the comforter. Now that I've been looking for one that actually fits, I see that all retailers use photos that do not accurately represent the size. They do give the dimensions though, so if you want your's to drape like the picture, be sure to check the measurements before ordering. Beautiful, soft and lightweight---and a steal! This down alternative comforter surpassed my expectations. My apartment has heat included and tends to run warm, so I wanted something that wouldn't make me too hot. I don't overheat with it, but it protects me from the draft when I have to crack the window to control the temp in my apartment. Perfect!!! The microfiber fabric is smooth and appealing; it isn't stiff and doesn't "crackle" like cotton sometimes does. The filling is very even---I've had down comforters with pockets that are practically empty, but this one's delightfully uniform. No cold spots! I absolutely love the down alternative, too---no feathers poking out of the cover! My mom got a lightweight down comforter from a catalog a year ago, and this one was 1/3 the price and every bit as nice. Exactly what I needed. The king size comforter description says it is 86 x 102 inches but in fact is only 83 x 96 inches. So consider ordering a size larger. The quality is fine however. Hi the O sleep all season premier microfiber down alternative comforter evidently I purchased the wrong one. I thought I was getting one with two shams I looked at so many that it was my fault and I had already open the box and the package assuming that the shames were inside of the comforter my fault I would not have paid that much for a comforter by itself but saying this the comforter is very comfortable it is what I wanted, however for our pets to lay on it we needed a thin quilt that doesn't attract hair, but being that is taking a little bit longer to get the items than we originally ordered, I wanted to wait to order the rest until we got all of our items. This was not the best idea being that all the rest of our items are not available anymore, there are other colors so that's good. Sorry, got off track, but that is one lesson you need to learn you might not want to wait if there's something you want, you might want to go ahead & get it especially if there's only so many available because they will be gone. We have the white alternative down king, covered with two twin size then throws and it actually touches the board on both sides of the bed and that's with a king size bed with a Topper made into it that is kind of old and a new 5-inch topper that we just got from Overstock and now alternative down cover over the top of it all. It looks great it looks great. Overall, I love this comforter. I bought a King to go on our Queen and it's the perfect size. I bought it during the winter and have been SO happy with it! It's soft and fluffy and fits perfectly in the duvet cover I bought for it. It's also got good weight to it, without being too heavy and the weight doesn't shift in the baffles. I have an ankle injury and can't sleep under heavy covers because it makes my ankle hurt. I've never that problem with this comforter. The downside :(... 1. We just bought a King mattress and the comforter barely fits....it only goes over each side and the bottom maybe 2-3 inches. Kind of bummed about that. 2. It's starting to get into the 100s in Phoenix and even though we keep our A/C at 69 at night, the comforter has become too warm to use. I was disappointed as it's supposed to be "All Season". That seems to be a bit misleading as I noticed today that the Warmth Rating for it is actually "Warm". All in all, I'm happy with the purchase as it's a great comforter. That being said, we're going to have to keep it on the Queen sized guest bed and find a larger, cooler alternative for our new bed. I needed to purchase a down alt comforter that was not too fluffy, not too warm and not too cold. When I first saw this one on sale for ***, I hesitated several times unsure whether to purchase it or not. I had the wrong mentality thinking because the cheap was too good to be true, the comforter must be flawed or disappointing. Either way, I took a risk and decide to make the purchase before the sale ends. It arrived on time as stated on the website but the warehouse did a terrible job packing up this product - Some of the comforter was exposed and sticking out of the box when it arrived my door. It looked like they stuffed this in a box, placed two strips of duct tape and called it packaging. Terrible. Fortunately, the exposed part of the comforter did not catch any dirt or was damaged. I get very cold before I fall asleep but then very warn in the middle of the night because of my old comforter. I did not have this problem with this product. I was happy to be able to sleep through the night without feeling too warm or too cold. For ***, this was a great purchase. I do not wash comforters often because I use duvet covers on the comforters. Although I hear a lot of negative reviews regarding the aftermath of washing this comforter, because of the way I will be treating mine, I cannot confirm if that is true or not. Purchased two of these All-season Premier Microfiber down Alternative Comforters. Reasons: 1. to give lift to the look of a chenille bedspread on the bed along as the main/only 'blanket' on the bed. The comforter give just the right fullness for the look of the chenille bedspread. Also the comforter is quiet, lofty, and warm when needed and cool when needed to be just covered with something. Easily fits inside a full/queen duvet cover for the second bed. I like the lofty look of the comforter inside the duvet. With end to end box construction there is an evenness to comforter. If you use a duvet cover regularly, then you just can't beat this comforter to put inside it. I have bought three of them - one full-size for my daughter and one each in King for my husband and I so we don't steal each other's covers! They have been durable and just right as far as warmth. Since we live in the Southern California foothills where winter gets pretty cool but never into subzero temps, we use heavy flannel duvet covers on ours and the weight of this comforter is just right to keep things from getting TOO warm. By itself, this comforter is very "cool" and I would not recommend on its own for colder weather. Sometimes we use them briefly without a duvet cover in the hot summer months, but more often than not will use a lighter weight duvet to keep things easy to clean. This comforter is pure white and unless you live alone, have no pets/kids and literally never encounter dirt, it's going to need washing much more often (and while mine have washed up very well in our regular home washer/dryer without much shifting of the filling, not sure how long they would stay nice with many repeated washings). If you know why you're getting this and what it will and will not do, you won't regret the purchase. I can't believe how nice this is for the low price. It's not down so I guess you have to remember that and compare apples to apples but I personally think it's better than down because there doesn't seem to be a good way to guarantee down quality and value. I've wasted too much money on down in the past that I won't even consider it anymore. I guess down is one of those things you really have to spend good money on. There are obviously no bargains or good deals when it comes to real down. It's really expensive and nice or it's still kind of expensive and it's garbage. Enough about down! This comforter is fluffy, lightweight while still warm enough for winter if you use a thin blanket in between the sheet and the comforter. I had to wash it and was worried but it washed beautifully. I did air dry it because I didn't want to ruin it immediately. I think it would be ok it you used dryer balls or just keep turning it and checked it frequently. I followed other reviewers advice and got a king because they said the queen ran small and barely went over the sides of their bed. The king is a little on the big side, hangs just a little longer on the sides than I prefer but I have a platform bed, no box spring. If you have a traditional bed make sure you order the bigger size. If you have a king then maybe look into another brand or just carefully check the measurements. They are accurate in the description, just not accurate according to standard sizes. Other than the size it's great. I would definitely buy this again. Much cheaper than comparable brands. Nice and fluffy, very comfortable. I used this under a duvet cover and it was perfect. This comforter is nice, but it is not heavy or warm enough for "all-seasons". It's definitely more of a spring, summer, fall comforter. Not warm enough for winter. I get cold very easily so it was important that I get a comforter that keeps me warm especially since the year-round nighttime temp is between 40-50 degrees. I mistakenly left my window open last night and it was approximately 45 degrees out. This comforter kept me warm, I hadn't notice the window was open until I got out of bed. Downside was after getting back in it took a few minutes for my body to warm up again. This is a light comforter for it's size so it's easier to maneuver around than other king comforters I've slept under. Out of the box, it was so flat that I was worried I would be cold. It took about three days to fully fluff, even then it is not bulky. My only real problem with this comforter is that it makes a fair amount of noise. If you are buying this to fill a duvet in perhaps a guest room, this is fine. But,I bought this for my sons room and planned to wash it every month or so - upon washing this for the first time, it came out of the dryer very lumpy - fill was very poorly distributed. I may try to dry it with tennis balls next time, but I was very unhappy with it because of this. Also, because it is microfiber and not cotton, it is hotter than a normal light weight comforter. If it had been very expensive, it would have gone back, but it's not worth the hassle. I would not buy again. This comforter is just right! Surprisingly, it has been light enough to sleep under in this summer weather and it has kept me warm in the colder months. It's very comfortable and has just the right amount of fluff. I actually put this comforter in my duvet covers and it fits nicely. I'm very happy with this product! I was trying to find a comforter that was cool. I'm one of those people that gets hot during the night and kick off my covers. But this comforter does the job. I didn't get too hot at all. I felt like Goldilocks and found the comforter to be just right! It's puffy but don't let that fool you, it's not heavy at all. This comforter is great if you want a soft, non-heavy bedcover. 'All-season' means not-for-cold-winters though, as it provides only adequate warmth. I live in SoCal so it's perfect here, but if you're in an area that actually has a COLD season, it's not meant for you. I ordered this comforter because our down one was too hot to sleep under unless it was less than 20 degrees outside. This is a great comforter. It fluffed right up after I took it out of the box and shook it, and the queen one was the right size for our queen bed (though if you want it to hang down far on the sides, I'd recommend the king size). The weight is perfect - just heavy enough for substance, but not too much. It's also light enough that we can use it in the fall or spring. However, it's definitely too warm for summer, at least if you have two people and their body heat under it; already on some nights when it was in the 40s, I found myself getting too warm, and I'm a pretty cool sleeper. Very warm and great buy for sure. My daughter wanted an alternative down comforter for one of her presents, so I went to Overstock first because I knew I would find a reasonable, quality one there. Soft comfortable and perfect for all climates. I am a hot sleeper, my husband is not and this works great for the both of us. I would recommend this purchase if your looking for a thinner more manageable duvet insert. Great price, fast shipping, good product! The colors in this piece is amazing. I ordered this for my daughter's bedroom and it complements the space absolutely perfectly. She is at an age where style and color are important to her and this absolutely beautiful and stunning design was the perfect choice. I am amazed at how quickly it arrived and how much quality is in the piece. It looks just like the picture. I will order this brand again. Good quality for your money. It's soft, not bulky, and holds its shape well in the wash. I prefer this comforter to one I purchased in the store. "Anyone wash it in a top loader?" It all depends if your washer is big enough. As long as the comforter is not too tight inside the upload washing machine. Otherwise, take comforter to coin machine and you can wash it there. Have purchased two of the queen sizes over the last 3 years. Have washed it in my top loader/on the cycle for ‘bulk/overload/sheet. It is a little tight of a fit but washes very nicely. "One reviewer said that the King Comforter is much smaller than what the description says which is: King: 102 inches wide x 86 inches long with 50 ounces of fill Can you check and verify the size please? Thanks"
We can confirm that the size is correct. I hope it helps. "I have a silk duvet cover. The cotton insert I have is a mess inside the cover, even tied and pinned together in the corners. Looking for an insert that wouldn’t be slippery next to silk. Would this insert work?" This is definitely not like the 100% cotton, goose down, it's nice enough for summer and it is very thin so it might work, however, it seems a bit too slippery to use with silk. One can really feel the difference in the quality with the alternative fill. If there is a thin goose down, cotton I would go with it. I wish I had. You might try a velcro tape that sticks on and can be removed for laundering. You can intersperse the tape along key points - no need to run the tape the entire length and width of the cover. Thank you both! I should say what I have now is a down insert with a cotton exterior. So slippery with the silk cover :-( However, this will now be used in a furnished, weekly rental for the summer. I know so many people that have allergies to down, so I’m looking for down alternatives for pillows and comforters. I’ll look into the Velcro. Ty! Never will I buy silk duvet covers again! But they were expensive. Just trying to make them work. "Does this have duvet hook ties on each corner?" No it does not. Not many except the ones from Europe have the internal tie -well except like pottery barn. But the quality of this comforter is great for the price. It's held up nicely - including washing/drying. "where can I get matching color pillow shams?" Unfortunately, we do not currently carry matching pillow shams. This item is not designed to be used on it's own as is. It is an insert for a Duvet Cover. When you buy a Duvet Cover, they typically come with matching shams. "I need a full/queen size and it's out of stock in that size. Will you be restocking in full/queen? I already have this duvet on my bed in king size and love it so I was wanting to use it on my guest bed also." "Has anyone washed this and have it tangle in a front loading washer? Also does the fabric inside clump up when put in the dryer? " I have two of these on separate beds and have washed and dried them both multiple times. I have never had a problem and I have a front load washing machine. They look as good as they did when I first got them. I wash mine all the time (I have a front-loader washer) and it never tangles or clumps. Every bed has this comforter (from full to King) since we're allergic to real down and have never had any problems. Always looks beautiful when it comes out of the washer and lays flat.